The Georgia Department of Transportation (GDOT) has plans to widen Highway 441 North, starting just above the Stekoa Creek Park in Clayton, GA, and continuing north for about 7 miles to the North Carolina state line. The construction phase of the highway widening project is scheduled to begin in 2019, and the planning phase has been underway since the 1990s. The GDOT recently completed a draft environmental assessment (EA) for the project, and the agency held a public “open house” on 3/22/16 to gather more comments. The Chattooga Conservancy attended this meeting, studied the environmental assessment to determine how the project may affect Stekoa Creek, and has submitted comments to GDOT. 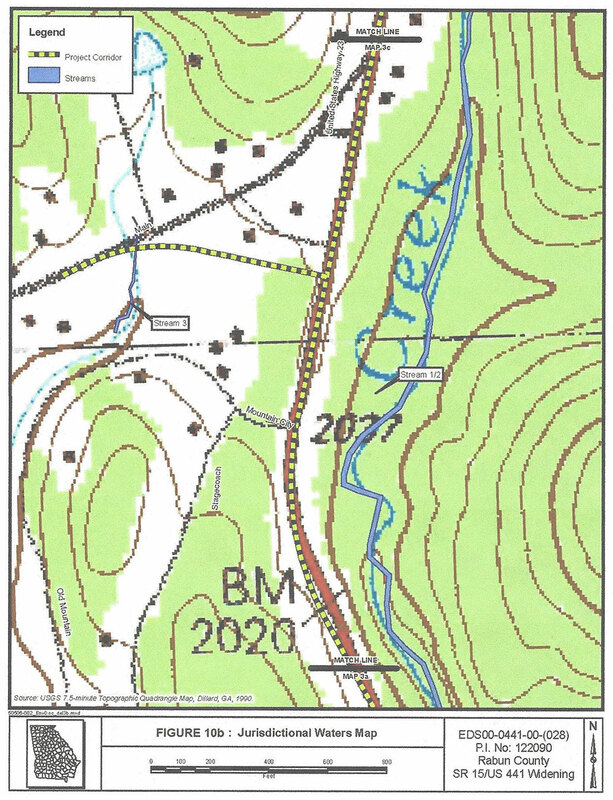 About 3 linear miles of Stekoa Creek, from the stream’s headwaters in Mountain City, GA, to Stekoa Creek Park, are located in the highway widening project area. The Chattooga Conservancy has an extensive record of water quality data from Stekoa Creek, that includes a water sampling point immediately downstream of the spot where the highway widening project is set to begin. It is very possible that ground-disturbing activities from the DOT would add more sediment to Stekoa Creek and cause its poor water quality to deteriorate even more. Further impairment of Stekoa Creek as a direct result of the DOT project would contradict Clean Water Act expectations and conditions. To protect Stekoa Creek and by association the National Wild and Scenic Chattooga River, we requested that the DOT’s design plans go beyond “common” stormwater management practices and implement permanent structural designs to mitigate stormwater pollution. In addition, we requested that the needed “compensatory mitigation credits” for impacts in the Stekoa Creek watershed be secured through conducting stream restoration activities at specific sites in the Stekoa Creek watershed. Work to convince GA DOT to consider implementation of our requests is ongoing.